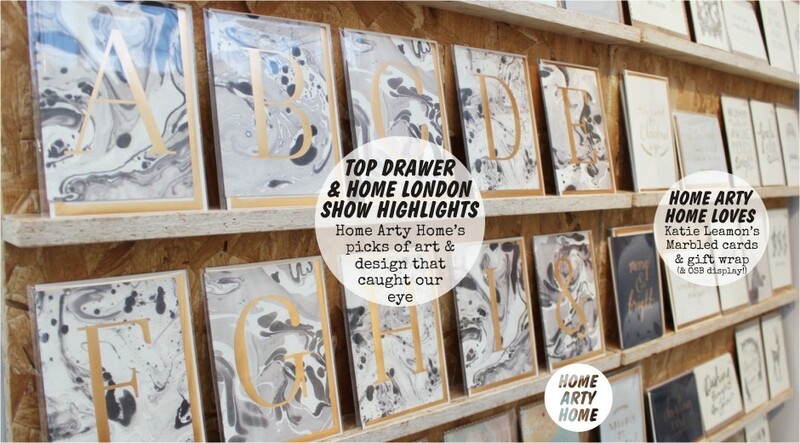 Home Arty Home got the chance to scout Top Drawer and Home London yesterday to discover some great new collections of art and design. 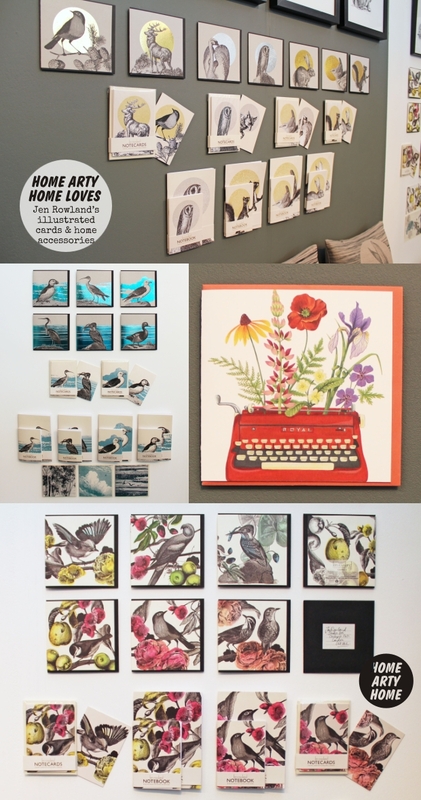 If you’re heading to Olympia today or tomorrow, make sure to take a peek at our quick pick of stand-out items from the following artists & designers (as well as from Mini Moderns at Wild & Wolf, Melody Rose and Marcus Walters that were previewed here). 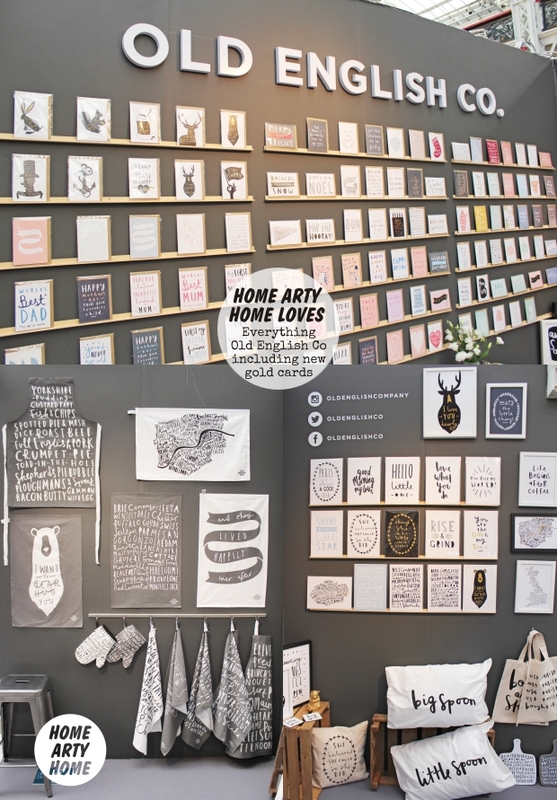 I’ll be making sure to feature more exhibitors who caught my eye in future posts, as there are simply too many to cram into here, but in the meantime, key themes to hunt down as you’re browsing the shows are marbling and shiny gold foil-blocked prints. 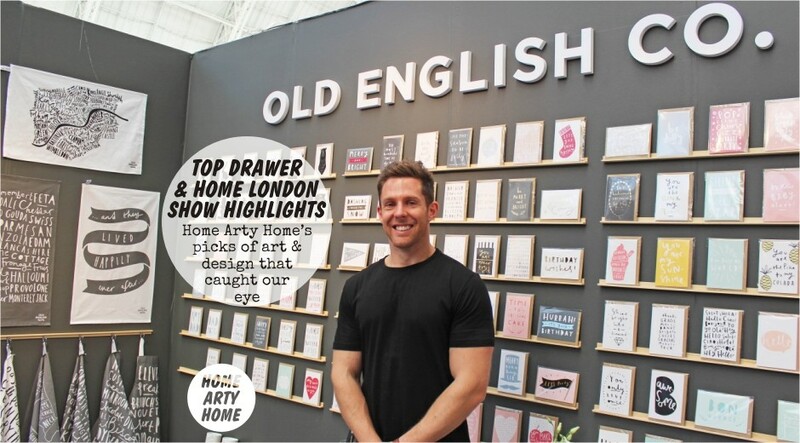 Old English Co. were the first company Home Arty Home interviewed for the site and, as well as being great to meet up in person at the show for the first time, it’s amazing to see founder Ben’s collection go from strength to strength. Alongside the expanding kitchen textiles, new greetings cards with shiny gold foil-blocking have been added to the extensive selection. Find Old English Co in Top Drawer at STAND L19. 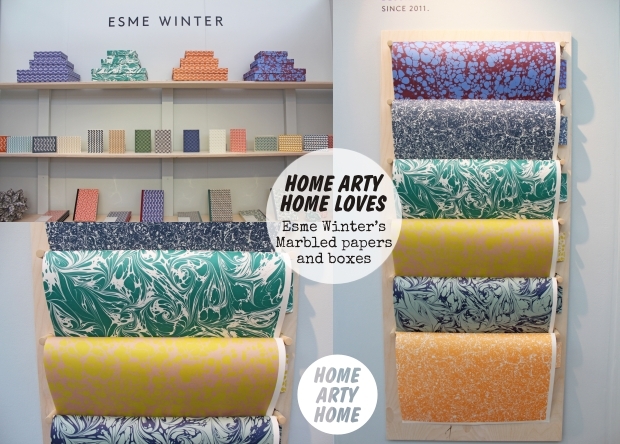 Esme Winter‘s marbled gift wrapping paper and boxes caught our eye immediately. 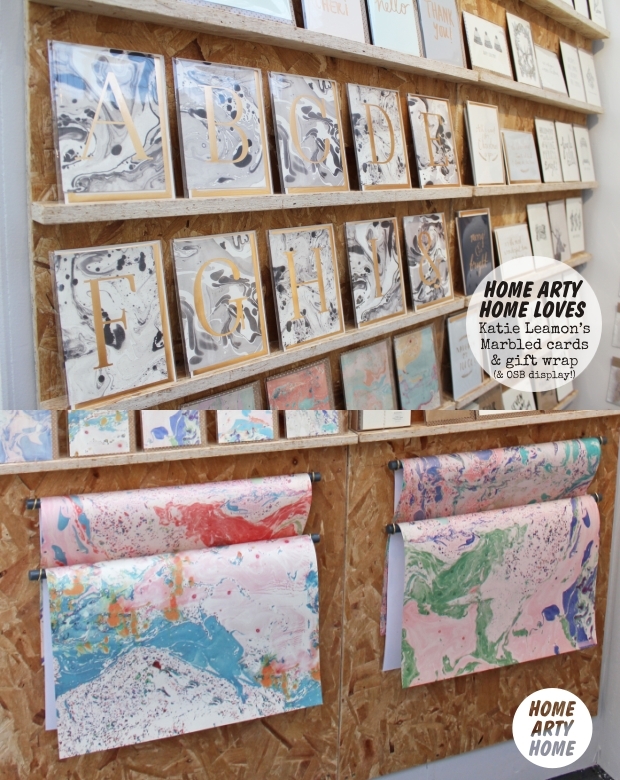 Each piece of marbling is unique using a traditional technique, in collaboration with Jemma Lewis, using acid free papers and vegetable-based inks. 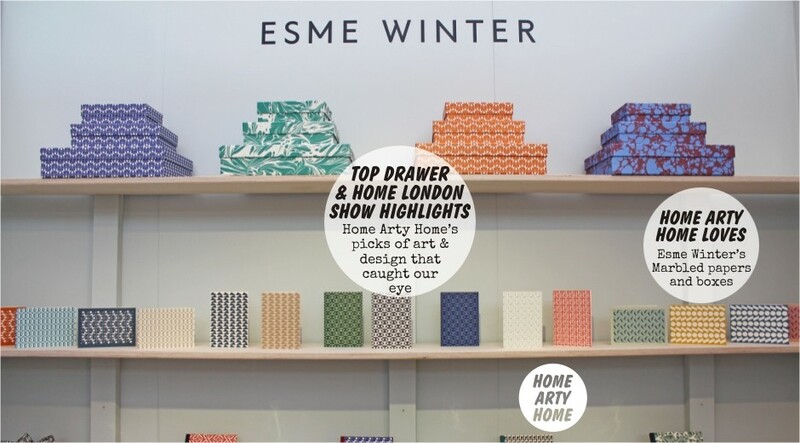 Esme Winter are in Top Drawer at STAND P20. 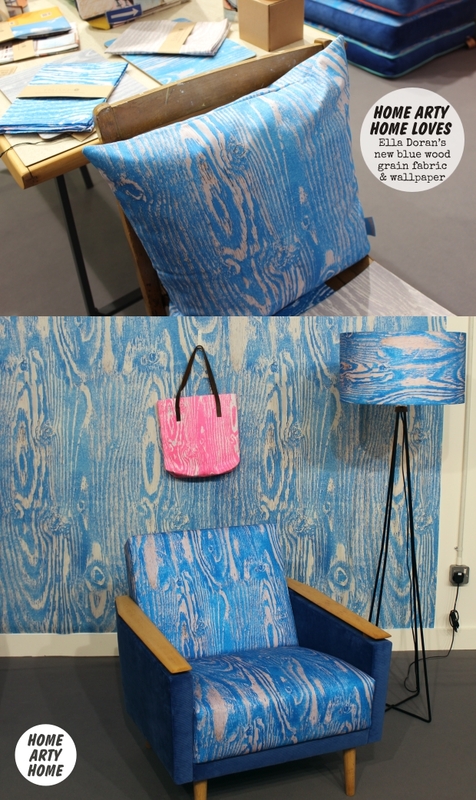 Ella Doran, another Home Arty Home favourite who, I must admit has been off my radar for a while but she made sure I noticed her from one end of the exhibition hall to the other with this striking new collection of blue wood grain. Like a moth to a flame, I was drawn to this amazing textural print which is available as tea towels, cushion covers, fabric, and wallpaper. Ella Doran is in Home London, STAND I33. As a fan of chipboard and OSB, Katie Leamon‘s display called out to me, upon which were a stunning selection of marbled cards with metallic foil letters or wording, plus multi-coloured marbled gift wrap. 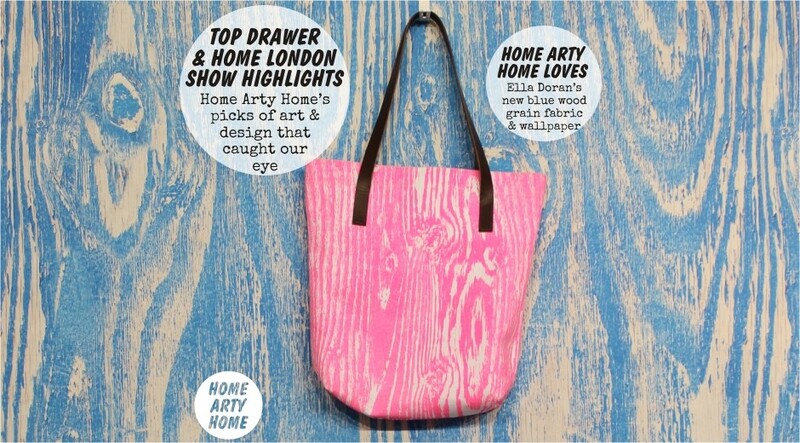 An exceptionally stylish collection, I’ll be making sure to feature more of Katie’s work on Home Arty Home in the future. Find Katie Leamonn in Top Drawer at STAND N18. Last but not least, I was immediately smitten with Jen Rowland‘s colour palette that seemed simultaneously fresh yet traditional. 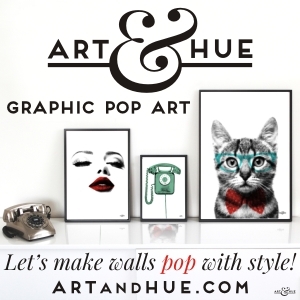 Illustrated greetings cards with gold or blue metallic foil blocking are sure to be treasured by the lucky recipients and are worthy of framing. 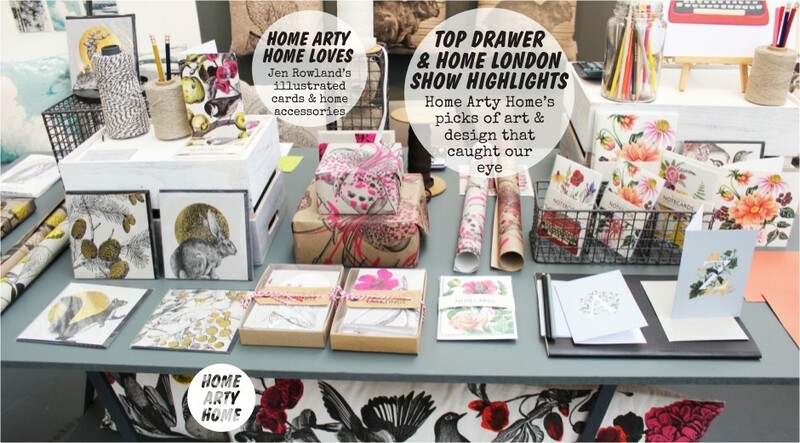 Discover Jen Rowland in Top Drawer at STAND P14. As well as art and design, there were numerous book publishers and magazines taking part, including Confessions of a Design Geek who are offering a discount to visitors of Home London to subscribe to Fiera Magazine, the biannual crowdfunded round-up of new talent at the world’s design fairs. Find Katie of Fiera at STAND I9c. 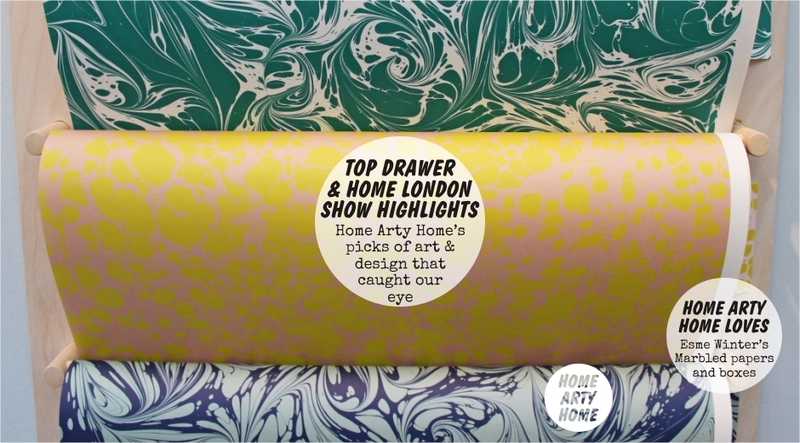 If you’re in the trade and eligible to visit (namely a buyer, writer, or interior designer), I hope you’ll agree there’s some great art & design to discover at the show and, if you do drop by any of the stands above, tell them Home Arty Home says “hello”!